Do not take chances by hiring a plumbing company who may show up without the parts and tools necessary to solve your problems. At Downey Plumbing, we have all of the required equipment, parts and talent to solve your heating, plumbing and air conditioning issues. We make sure our experts have the tools and parts on-site to handle anything from minor repairs to performing routine maintenance or installations. When you are searching for an expert plumber in Downey or surrounding areas of southern California, you can contact Downey Plumbing and we can be there within the hour. Our years of expert service to our commercial and residential customers has led us to understand the tools and parts that are needed to deal with most plumbing, heating and air conditioning problems. Our expert technicians are fully trained and up to date on the latest technology. 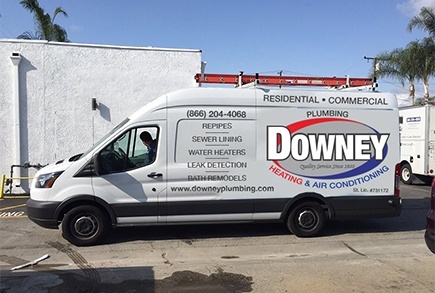 Don’t hire a plumber that will show up with an empty truck and screwdriver – Downey Plumbing, Heating and Cooling contractors will always arrive in a well-stocked van so they can fix your problem right away.